The Coalition on Truth and Justice, CTJ, has called on the Chief of Army Staff, Lt. Gen. Tukur Buratai, to sustain early year successes on counter insurgency campaigns. The group, while addressing the press on the success recorded by the Nigerian army in the fight against the extremists in Kaduna on Sunday, said the voluntary release of a Chibok Girl by Boko Haram and release of 700 captives from the sect’s custody were clear indications that the army was on course. The coalition noted that for the first time since the insurgents in the Northeastern part of Nigeria decided to take up arms against the Nigerian State, the nation has witnessed what more than a significant feat in the fight against insurgency with the voluntary surrender by the Boko Haram sect of their important captives. Barrister Charles Timothy, National President, who spoke on behalf of the group, noted that recent feats was a good sign for Nigeria that 2018 will witness a significant stride in the bid to dislodge and incapacitate the insurgents as well as bring peace and calm to every section of the country. His press statement reads in full. “With the further onslaught recorded by the military as signified by the wounding of one of the Boko Haram commanders within the same period, we see it as a patriotic duty, not just to commend the Nigerian military whose men and officers have remained in the trenches while the rest of the country was enjoying the Christmas and New Year season, but to envision what the result of a sustained campaign would impact on the polity. “These developments coming at the same time are signs that the last phase of the final defeat of the terrorsist by the Nigerian Military is here. “This has laid to rest pessimism and cynical observations that the decimation and degradation of Boko Haram by the current administration is only a claim as it is evident that it was the degradation and prior onslaught on them that compelled the Boko Haram insurgents to release those in their captivity without any fight or negotiations from the military. This also signals hope to Nigerians and the rest of the world that the Nigerian Army is capable and will rescue the last person ever taken into hostage by the insurgents. 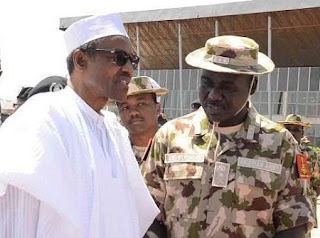 It is obvious that the Boko Haram terrorists are already weak as they are already running into neighboring countries like Niger, Chad and Cameroon to surrender which is a testament to the humiliation of these elements by the Nigeria army. “In view of these, we call on the federal government to work out an immediate strategy for the insurgents to drop their arms. This would involve making a final and direct call on them to lay down their arms within a given period or be mauled down.